Laura Ingalls Wilder (/ˈɪŋɡəlz/; February 7, 1867 – February 10, 1957) was an American writer known for the Little House on the Prairie series of children's books released from 1932 to 1943 which were based on her childhood in a settler and pioneer family.During the 1970s and early 1980s, the television series Little House on the Prairie was loosely based on the Little House books, and starred Melissa Gilbert as Laura Ingalls and Michael Landon as her father, Charles Ingalls. 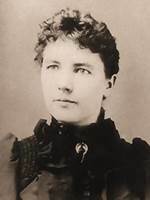 About More..
Laura Ingalls Wilder Need to know more? Try visiting our FAQ page to learn more about our greatest ever expanding Books, Laura Ingalls Wilder. Laura Ingalls Wilder Have a question?